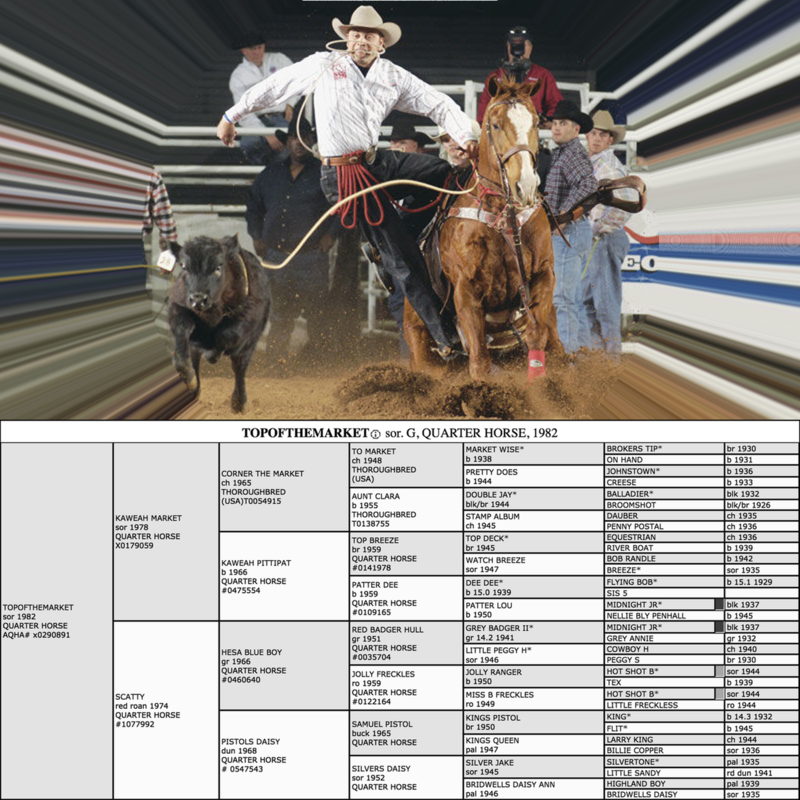 Topofthemarket, or “Topper”, was undisputedly the best rodeo calf roping horse of the past quarter century. He may be the best ever. He was owned by calf ropers Roy Cooper, Trent Walls and Stran Smith and carried others such as Cody Ohl, Joe Beaver and Herbert Theriot to great rodeo success. Without a doubt, he should be inducted into the ProRodeo Hall of Fame. The timing involved in his career, however, is best described as peculiar. A world title-caliber roper never owned Topper in the prime of his career, although he did carry one roper to a world championship. Described by all as a horse who knew how to take care of himself, he lived to be 25 years old, but died in great health when he opened his own gate and wandered out onto the highway for green grass, where a truck hit him. Topper was an athlete beyond compare, a winner with a champion’s heart and an intense competitor. Yet outside the arena he had the personality that somehow mixed between the sweetest dog you’ve ever known and a 13-year-old boy. If he could have fed himself, he would have lived on hot dogs, red-hot Cheetos and peppermints. In fact, Pickens told the magazine, he would have never trained the horse to rope calves had it not been for two old-time calf ropers he roped with who saw something special. A man named Albert Shaw first discovered Topper in 1987 while a now-forgotten college competitor was riding him. Shaw, a calf horse trainer, took the horse in and worked with him. As a friend of Roy Cooper, he happened to know the five-time world champion calf roper was looking for a new horse. With his father, Tuffy’s blessing, Cooper knew he had a solid prospect. Tuffy christened him Topper, and for the next few years he went into Roy’s training program. At the age of eight, Topper hit the road with Cooper. Once out on the road, there was no question he was a great horse. Cooper rode him to six Wrangler NFR qualifications, an NFR average title in 1995 and dozens of regular season rodeo wins, including the $50,000 jackpot at the Calgary Stampede. 1994, however, was the year Topper made the transition from a solid mount to a proven winner. At the Finals that year, Theriot had a chance to win the title. As the end of 10-day survival-of-the-fittest competition drew near, Theriot felt he had to gain an edge over Joe Beaver, so he found Topper. He had to tie his final-round calf in 7.9 seconds to win the championship and that was exactly what he did-edging Beaver by a mere $14. That was as much as Topper was ever involved in a world championship. Roy’s time with Topper lasted 15 years. The horse allowed Cooper to compete against ropers half his age. He prolonged his career. Unquestionably, Cooper shaped the horse. The winner’s attitude and the toughness the horse possessed came from his time with the Super Looper. Cooper’s personal life was changing, however, as were his goals. He knew rodeoing for a living was no longer in his future and had to move to a new chapter in his life. He also knew that Topper was still a strong, willing and ready competitor. He began to float the idea of selling him. In 2002, Trent Walls had the makings of a great ProRodeo career. He had made the NFR in 1998, had the PRCA/AQHA Horse of the Year that year, Deuce, won the California Rodeo Salinas twice, Pendleton and Caldwell once. But he was having horse trouble. He had sold Deuce and bought a young horse that ended up crippled. He sold a horse name Hustler that Cody Ohl went on to win the world on in 2003. Walls had missed the previous three Wrangler NFRs. Traveling with Trevor Brazile, who was dating Roy Cooper’s stepdaughter Shada at the time (they married in 2001); he began to talk about moving on. Immediately, he knew it was Topper, but he didn’t think Roy would really ever sell him. Walls got busy. He ran his calf in Flagstaff, Ariz., that afternoon, jumped in the truck, drove all night and got to Cooper’s in Childress first thing the next morning. He roped three calves on him and knew he wanted him. Walls scrambled around and found the money. At the time, everybody was like, Holy moly, $50,000 for a 19-year-old horse?” Walls said. “I had a lot of doubt. I had only rode him once. We were at Vinita, and I was rodeoing with Stran and my horse had yanked a shoe and was kind of crippled. I asked Roy and he said, ‘Yeah, you can ride him, but you’ve got to win something or you can never ride him again.’ I was probably more nervous then than the first night I went to the NFR. I won fourth and at least didn’t embarrass myself. “I gave him $50,000 for a 19-year-old horse I didn’t know the first thing about. He might not last two months, but he X-rayed like a colt. Not one blemish, like he was brand-new. The next year, Topper carried Walls to his second (and so far final) Wrangler NFR qualification. Once again, Topper rejuvenated a roper’s career. He only owned him for two years, but one of Topper’s greatest transitions came during his time with Walls. Whether it was part of the aging process, the treats Cheyenne spoiled him with or some other unsaid factor, Topper became a character. At the Puyallup (Wash.) Fair and Rodeo, timed-event competitors have to ride their horses down a carnival midway to get to the arena. It’s always packed with people eating fair food and playing games. After the performance once, Trent and Stran were leading Topper down the midway. A boy was holding a hot dog in one hand and approached the cowboys hoping for a chance to pet their horse. Topper snatched the hot dog from the boy’s hand and devoured it instantly. “I bought the kid another hot dog,” Walls said. Unfortunately for Walls, later that year, after the 2002 NFR, his father, Terry, was diagnosed with a brain tumor. Soon it was obvious that Trent was needed at home to run the family’s stock contracting business. Topper was always meant to be Stran Smith’s horse. Perhaps, however, they both had to go through their share of experiences before it would be as meaningful a partnership as it became. Topper’s specialty, remember, was rejuvenating careers. In 2002, after making six NFRs, Smith was forced to undergo knee surgery and missed the Finals. Then, early in 2003, unbelievably, he suffered a stroke. Some doctors told him he was finished, and that he would never rope another calf. After finding a willing doctor and an experimental procedure, the small hole in his heart that caused the stroke was repaired and he could get back to roping. He just needed the right horse to get it started. It was no secret that Topper fit Smith. For a time, Cooper and Smith were brothers-in-law, Roy being married to Stran’s sister, Shari. Smith, therefore, had a little easier access to Topper than most ropers. Interestingly, it wasn’t until 2003, the year Walls and Smith partnered on Topper, that he won the award he’d deserved for probably the past decade. He was named 2003 PRCA/AQHA Horse of the Year. At the time, Smith told the ProRodeo Sports News that he felt Topper was at the top of his game. In 2005, Topper won the award again. By the time 2004 rolled around, Smith was healthy, armed with the best calf horse in the business and motivated to make a run. Smith gives the best perspective on what Topper brought to the arena. “He gave everything he had every time,” Smith said. “It didn’t matter if you were practicing at a jackpot or the NFR. He was made for it, he was a natural. There are probably 200 horses out here that have as much ability physically as he had; so then it comes to try and his heart. Everybody always says they want to be around a winner and everybody who rode him won. No matter what the circumstances were. Cody Ohl puts Topper’s legacy in more stark terms. Gregg Veneklasen, DVM, who has probably seen and worked on more rodeo horses than any other veterinarian, could tell Topper was special, too. But there was even more. Smith contends that Topper knew how to disassociate competition and relaxation. 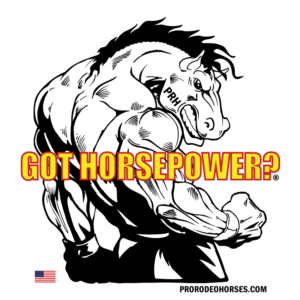 Most performance horses like that don’t know how to turn off their competitive nature and are always edgy and even harbor a certain amount of fear in them. Not Topper. “I’m sure that all great athletes have that air about them. Maybe it’s different for horses. You knew it whenever you were around him. I let (my son) Stone ride him and he was good about it, but when it come to business time, the kids got out of the arena. He knew it was business. He wasn’t buddies anymore. He knew when to turn that on and turn that off. We were buddies and pals until it came time to rope. The two years that Smith was able to put a full season in with Topper at his disposal (he only used Topper sparingly as he got older) he finished second and fourth in the world. 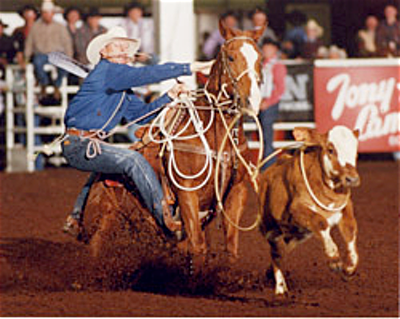 Both years, 2004 and 2005, he was the last calf roper to back into the box in the 10th round of the NFR-meaning up to that point he had won more money than anyone else-but both times lost out because his competitors had more average money. Simply put, Topper made Stran Smith a better roper. Those around Smith and Topper knew it, too. Smith’s father, Clifton, took care of the horse while Stran was on the road and, of course, saw the horse in action as much as anyone. Kyle Kukla, who drove for Stran when he was competing on Topper and now competes himself, echoed those sentiments. In 2004, Smith won three rounds at the Finals and made $64,070 there and finished second in the world. In 2005, he was second in four rounds, won $64,111 in Vegas and finished fourth in the world. Stran knew that Topper brought him to a higher level, too. All that right there would have been enough to secure that horse’s legacy in the professional rodeo world. But there was more to Topper than that. His personality was unequalled. He made those around him love him. To a man, they all said they’d miss his personality more than his in-arena abilities. Plus, old Tops had one more rejuvenation project. Clifton was also touched by the horse’s warm personality. In 2006, Stran struggled. On the bubble as the year ended, he was pressing to make the Finals. At the last regular-season rodeo in Kansas City, on Topper, he dislocated his shoulder and tore ligaments away from the bone in the process. At first, his career again looked to be threatened. He missed the Finals, had to wear a sling and undergo intense physical therapy. Smith recovered, and at his first rodeo back called on his go-to guy. Kukla, Smith and Topper all loaded up at Smith’s home place in Childress for the trip to Rodeo Austin. For Kukla, who had moved on from driving for Smith, it was like old times. The old gang was back together. 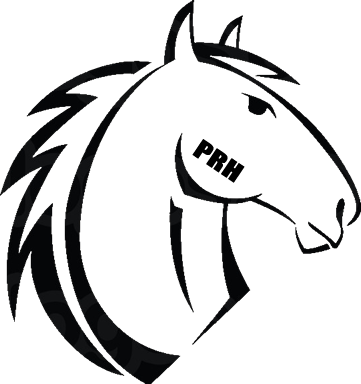 Stran placed fifth in the second round, third in the final round (a 9.4-seond run where Topper made a bad calf workable) and second in the average. He was back. Yet again, Topper was there to rally his rider. Ten days after the win, on April 5, with Stran, his wife Jennifer and sons Stone and Scout out of town, Topper got out of his stall, grazed around the yard and eventually out onto the highway approaching Childress. A truck hit him. Amazingly, with a broken leg, Topper drew on his incredible strength, heart and try, made it back to his stall, lay down and died. Trent Walls was just as saddened. He still loved the horse. He was buried, standing up, on Clifton’s ranch-the highest point just outside of Childress. Those who knew and loved the horse have struggled with his untimely death. But Topper took good care of himself and was always right where he was needed. Perhaps he was needed somewhere else, somewhere more important than the planet earth, somewhere high above the little town of Childress. Clifton knew the horse was something special and hopes he’s awarded for it someday. Instead, Stran is determined to find the good in what happened. But, due to modern technology, there’s still hope for Topper’s future. Although he was a gelding, the Smiths worked with Dr. Veneklasen to have Topper cloned. Stran’s enthusiasm is a little less tempered. With Topper’s history, who knows, the boys might just need a good one about then.